DOHA, Qatar, 2017-Oct-30 — /Travel PR News/ — Qatar Airways has responded to increased customer demand for services to Thailand by launching direct flights to Pattaya, the airline’s fifth route to the country. The new four-times-a-week service, which starts on 28 January 2018, is in addition to the airline’s existing flights to Bangkok, Krabi, Phuket and soon to be launched, Chiang Mai. The launch of the service to historic Chiang Mai is scheduled to start on 12 December, 2017. 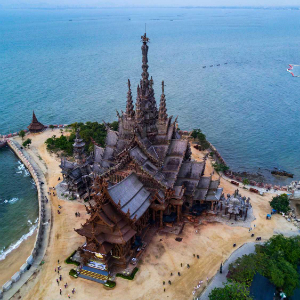 Located on the popular southeast coast of Thailand, Pattaya and nearby Rayong are major destinations for sun-seekers looking to soak up the local culture or relax and bask on one of the areas extensive beaches. Holiday-makers on the route are expected to come from Qatar Airways’ extensive network of destinations across Europe and the Middle East. Qatar Airways Group Chief Executive, His Excellency Mr. Akbar Al Baker, said: “We are delighted to announce the launch of our newest route to Pattaya in Thailand, our fifth route to one of Southeast Asia’s most popular destinations. Thailand is continuing to grow in popularity with our passengers, who love travelling to this beautiful country to enjoy its incredible culture, cuisine and natural scenery. Qatar Airways will operate a Boeing 787 Dreamliner, with 22 seats in Business Class and 232 seats in Economy Class on flights between Doha and U-Tapao Rayong Pattaya International Airport, on its winter schedule. It will be the first five-star Middle East airline to offer flights to and from Pattaya. Qatar Airways’ new service to Pattaya will help to reinforce the strong ties between Qatar and Thailand. Qatar Airways currently operates flights to three destinations in Thailand, with services 35 times a week to Bangkok, 14 times a week to Phuket and daily to Krabi commencing 1 December 2017. From 12 December 2017, Qatar Airways will also fly four times a week to Chiang Mai, which will take the airline’s weekly frequency to 60 flights a week. Qatar Airways operates a modern fleet of more than 200 aircraft to a network of more than 150 key business and leisure destinations across Europe, the Middle East, Africa, Asia Pacific, North America and South America. The airline is launching a host of exciting new destinations planned for the remainder of this year and 2018, including Canberra, Australia; St Petersburg, Russia and Cardiff, U.K, to name just a few. Qatar Airways, the national carrier of the State of Qatar, is celebrating 20 years of Going Places Together with travellers across its more than 150 business and leisure destinations. The world’s fastest-growing airline will add a number of exciting new destinations to its growing network in 2017/18, including St. Petersburg, Russia; Chiang Mai, Thailand; Canberra, Australia and many more, flying passengers on board its modern fleet of more than 200 aircraft. Oryx One, Qatar Airways’ in-flight entertainment system offers passengers up to 4,000 entertainment options from the latest blockbuster movies, TV box sets, music, games and much more. Passengers flying on Qatar Airways flights served by its B787, A350, A380, A319 and select A320 and A330 aircraft can also stay in touch with their friends and family around the world by using the award-winning airline’s on-board Wi-Fi and GSM service. Qatar Airways Cargo, the world’s third largest international cargo carrier, serves more than 60 exclusive freighter destinations worldwide via its world-class Doha hub and also delivers freight to more than 150 key business and leisure destinations globally with more than 200 aircraft. The Qatar Airways Cargo fleet includes eight Airbus A330 freighters, 12 Boeing 777 freighters and one Boeing 747-8 freighter. This entry was posted in Airlines, Airports, Flights, Travel, Travel Services, Travelers and tagged direct flights to Pattaya, His Excellency Mr. Akbar Al Baker, Qatar Airways. Bookmark the permalink.